Assume the following situation in Adobe Illustrator, where I have two neighbouring anchor points on the same path. For the left anchor point, only the left bezier-handle is important and for the right point, only the right one. There are no bezier-handles pointing inwards. 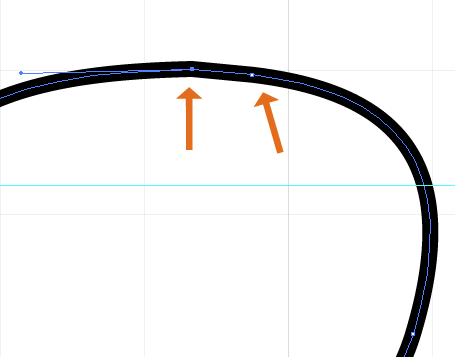 Is it easily possible to merge these two points into one point which has two bezier-handles: the left from the former left point and the right from the former right point? When simply moving one over the other, the two points are still existent and something like simplify path changes the look of the whole path which is not wanted. and assume that the horizontal line at the top is an artefact. Merging the two points into one without loosing the left and right bezier handle can be done in the following steps. Use the direct selection tool to select the horizontal part between the points in question and press delete to remove it (thanks to Pdxd for pointing out that you don't need the scissors for that). The Unite command (Pathfinder panel) works correctly for merging two anchor points. No. Not with the stock version of Illustrator. Because any alteration to either anchor's position will ultimate alter the path, there's no way for Illustrator to calculate the removal of one anchor and retain the path position. Illustrator, out of the box, is simply not that smart. Object > Path > Average can position both anchors into the same location. However, since the anchor's move, the path is altered. One could manually move one anchor on top of the other. But, again, moving either anchor alters the path. In both these cases, after the anchors are on top one another, you could remove one of them. But still, removing one anchor removes it's Bezier handles as well, thus even further altering the path. The only method I know is to use the Smart Removal feature which exists in http://www.astutegraphics.com VectorScribe plug in. The smart removal feature will allow you to select and remove one anchor and the path position will remain in place, altering the Bezier handles of the remaining anchor to match the path rather than altering the path to coincide with remaining handles. Some slight alteration may still occur. However, the smart removal features is the only thing I'm aware of which is even remotely capable of doing what you are asking. I only know how to do this with short cut keys but when I have more time I'll update this. If you are on the Mac, select the 2 points with the white arrow (direct selection) and press Cmd+Opt+J. This will bring up a window to bring the points together in the most accurate way. Select both and click ok.
You can then use the bezier with the minus sign to remove 1 of the points. I have had similar problems. One thing that worked (in CS6) was to (a) superimpose any groups of two points with direct selection then Object -> Path -> Average: "Both" for each group; (b) join the multiple paths; and finally (c) Object -> Path -> Simplify with a "Curve Precision" setting of 100%. (Steps a and b may be interchangeable.) This seems to remove the extraneous point superimposed directly underneath the averaged points, although it may also move various control points around in the path when making the simplification adjustment. However, because the precision setting is 100%, it should not move the path at all. The main disadvantage here would be if you wish to use a standard grid somehow to make future adjustments to the path, and not being able to hit those points on your original path may be a burden. Not sure if I'm understanding the question correctly, but it seems to me that if you want to join two overlapping end points and have their curves remain unchanged, the 'Connect Selected End Points' button is the key. I'm using CC, not sure if the same function exists in earlier versions. Not the answer you're looking for? Browse other questions tagged adobe-illustrator path or ask your own question. Illustrator: is there a way to toggle snapping while moving anchor points? 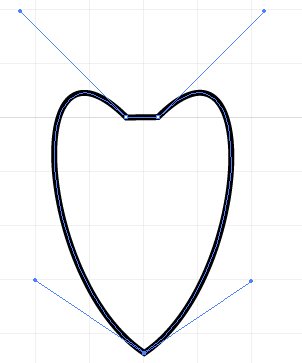 Moving both handles of a bezier curve simultaneously in Adobe Illustrator? 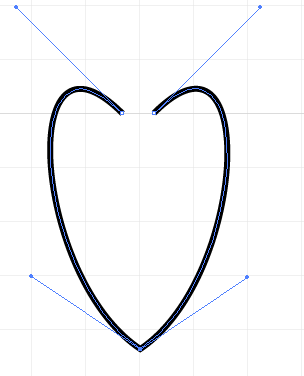 How to get handles on the starting anchor point of a path with out leaving pen tool in illustrator? 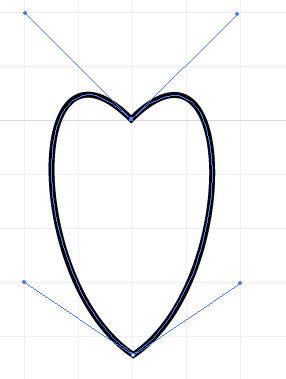 Remove an anchor point's bezier handle? 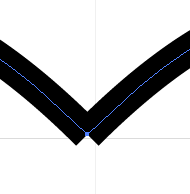 Illustrator - Select an anchor point that is directly beneath another anchor point on the same path?